Rapid infrastructural development, increasing demand for IP and high resolution surveillance cameras coupled with increasing security concerns have fueled the demand for video surveillance storage devices in India. Additionally, several technological advancements such as face and voice recognition as well as HD video and audio recording are also gaining high acceptance. Further, rising demand across various verticals is one of the key growth drivers for the expansion of video surveillance storage market in the country. According to 6Wresearch, India Video Surveillance Storage market size is projected to grow at a CAGR of over 10% from 2017 to 2023. India is increasingly registering transition of IP Video Surveillance systems from analog, which has resulted in rise in need for high capacity and better storage solutions. The Network Attached Storage (NAS) technology recorded highest revenue share in overall India Video Surveillance Storage Market share in 2016 owing to increasing usage of wireless devices, growing adoption of cloud technology and rising IT infrastructure in the country. In 2016, Government & Transportation, Commercial Offices & IT/ ITeS and BFSI verticals held highest revenue shares, however, other verticals such as hospitality & healthcare, retail and logistics are expected to contribute key revenues in India Video Surveillance Storage Market forecast period. The India Video Surveillance Storage market report thoroughly covers market by technology, deployment, Verticals and Regions. 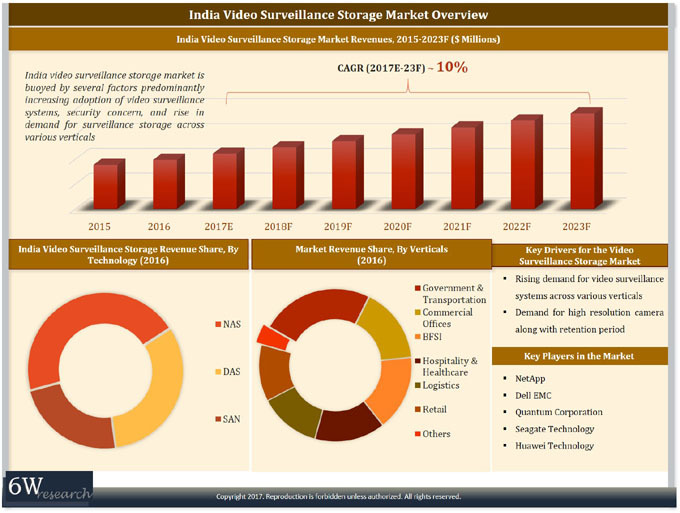 India Video Surveillance Storage market outlook report provides an unbiased and detailed analysis of the on-going India Video Surveillance Storage market trends, opportunities/ high growth areas, market drivers, which would help the stakeholders to decide and align their market strategies according to the current and future market dynamics.